I love my natural hair and dedicate quite a bit of time to keeping it healthy, so I spend copious amounts of time searching on the internet for natural hacks to add to my hair regime. Several months ago I was looking for a replacement for shampoo (I try to shampoo as infrequently as possible due to having extremely dry, curly hair) and I came across a Youtube video with the perfect solution. Now when I tell you what I have been using in my hair and on my skin I don’t want any judgement. I was skeptical in the beginning too, but when something works it works! I have been using….. fermented rice water. I know that it sounds disgusting and smelly, but let me tell you it is UH-MAZING for you! The longer the rice water has a chance to ferment the more potent it becomes and the more noticeable the effects of it are. Rice water is rich in antioxidants, vitamins B & E, and minerals making it extremely nourishing for your hair and skin. With fermented rice water being slightly acidic it’s closer to the natural PH of your scalp and helps seal your follicles. 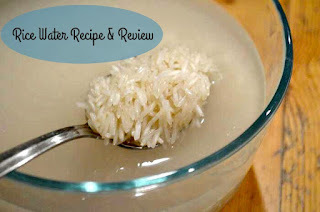 If you have high porosity hair ferment rice water is for you. Since using rice water my hair has been shinier, less prone to tangles which aids in it’s growth, less shedding, and it stays moisturized longer. Also due to the inositol that’s in rice water I have noticed less split ends. I have also noticed softer, more moisturized skin, and fewer blemishes as well as some of my old acne scars beginning to fade. There are several ways to make rice water. Some choose not to ferment their rice waters, while others do. I choose to ferment my water due to my natural hair being so dry the more potent rice water better moisturizes my hair. If you have oily hair I recommend the non-fermented rice water and diluting the rice water until it’s only slightly cloudy. Let the tea steep until water is room temperature. Cover the saucepan with a lid and let sit at room temperature for 1-2 days. Side note: Instead of throwing out the rice I used to make the rice water I will either finish cooking it and eat it or I will make a face mask. I like to keep the masks I apply to my face simple by using only a couple of ingredients. I also try to only use ingredients I can ingest. Combine 4 tablespoons of honey, 2 tablespoons of olive oil, 1 tablespoon of lemon juice, and 10 drops of essential oils. You want the face mask to have a paste like consistency. I hope you guys choose to give rice water a chance because there is no doubt in my mind that you'll love it. Let me know in the comments below how your experience with rice water goes.